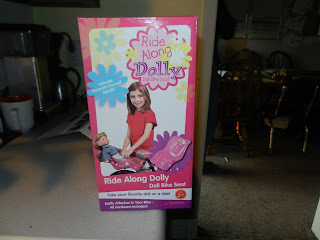 Okay, so this Ride Along Dolly Doll Bike Seat came in the mail so I could review it and stuff. 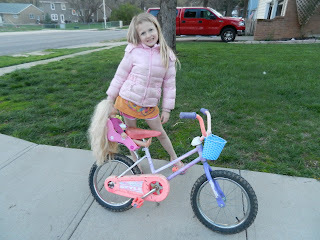 My girls were super excited, but only one has a "real bike" ... so Callie was chosen to try out the product. 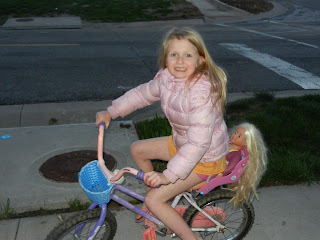 So after she put on the included decals and had so much fun doing that, it was time for Mr. Kerrie to assemble the seat. Callie would not get off her bike and rode up and down, up and down the sidewalk with her American Girl Doll-knockoff (how well do you think a $100+ doll would fare in my house, people? So we just don't even go there ... we get the $30 Our Generation Dolls from Target, thank you very much). Rather, SANTA does. 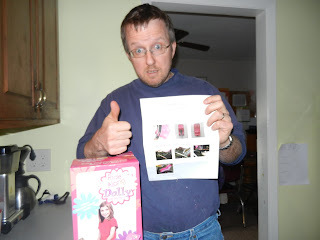 My little model loved this so much. The doll needs a ponytail, though, because her hair almost got caught in the spokes. And I noticed that the seat was saggin' a couple of weeks after it was installed. Mr. Kerrie said he fixed it but it sagged again. Just sayin'. If I was not honest you would not love me. Hook up with them at Facebook and Pinterest!